“What will you do with that major?” is a question that every student gets, especially if you are looking at majors that do not seem to tie to a particular career. Actually it is the wrong question because it assumes that the subject is what you will do. It assumes that if you major in history you will be a historian and if you major in philosophy people will laugh at you and say where are the philosopher jobs. In reality most English majors are not teachers of English or novelists. They are lawyers, ad executives and a bunch of other things that require great communication skills. Philosophy has often been considered a good gateway to the law or any field requiring logic skills—including technology. Many Psychology majors are doctors and others are corporate executives in marketing, sales or human resources as well as social workers because they understand people—among other skills. The question is not what will you do with that major but what skills will you get from that major that you can use in the course of your long and varied career. And most of you will have varied careers. It is likely that you will have 8 different jobs before you are 30 and maybe 3 careers before you retire most likely at 70ish!) What majors deliver are bundles of skill sets. Some will be more concentrated in one field versus another. So an Economics major will have more quantitative skills and an ability to read data. That could be useful for sure in finance, but also in market research for advertising strategy or strategic planning or consulting. Or one could become an economist. English majors are lawyers, policy wonks, journalists, doctors… pretty much anything. English and History are particularly helpful for building skills in close analysis, reading and writing—as in communication skills. The Association of American Medical Colleges has announced that the Medical College Admission Test (MCAT) will include a new behavioral sciences section —recognizing the importance of the humanities to the future of medicine and the need for doctors to understand how to engage with patients as people. So what you can do with those majors could be become a great doctor. There are history and English majors who have been hired at Goldman Sachs. They had stellar GPAs. So that is the other thing a major can do. What you can do with that major can be to show off how smart you are. If you find a subject that grabs your attention and in which you are excelling then that is a good choice of major because you will have a GPA that shows off your intelligence. You have to find a major that is the right fit for how you think and learn. If you are happy as a clam in a lab you might want to not have to ever write a paper more than 5 pages. On the other hand if you are the student who revels in 19th Century British Literature you may run from a test tube. Most of us have preferred modes of learning and taking in information. So what you will do with that major is show that you are smart and that will open doors for you. To some extent all majors capture elements that you will use in your work at some point. All require reading—just some more than others–, as well as requiring research in the lab or the library, critical thinking about what issue is being posed, the ability to analyze data or other inputs and the ability to report conclusions cogently. One student, seeking to become a CSI (Crime Scene Investigator, like on TV) began to realize that that the history course he was grumbling about was a actually a great way to learn forensic skills because he was asked to do research and offer evidence for his thinking. For a long time there has been a drive to get students to major in what have been called the STEM disciplines: Science, Technology, Engineering and Math. But recently the arts have been added to make the acronym STEAM. The reason for adding the arts is because creativity is also an essential skill in today’s economy. It is all about innovation. All of those skills will crop up, certainly in any managerial role or job. Ask people who are successful what they have done with their majors. People who have been around for a while have many stories where they have been assigned projects outside their normal comfort zone and had to rely on what they learned in college of research or data analysis or documenting evidence. You don’t get to tell the boss that what s/he wants you to do wasn’t what you majored in. Finally it is expected these days that all college graduates, in addition to being able to write decently will also have the ability to engage in technology at a bare minimum to navigate Excel, Microsoft word, PowerPoint, and basic elements of social media like Facebook, Twitter and Linkedin. Knowing more is clearly better whether it is the ability to use LexisNexis, how to code or knowing other research platforms. If you major in any social science—Sociology, Psychology, Political Science, and certainly Economics you will learn how statistics work and have other skills relating to accessing and using data. Most jobs whether in the for-profit or not-for-profit sectors have some quantitative aspect ranging from budget management to gathering and reporting data on outcomes. These skills can come through the major or from other courses or from project work. But they are necessary. They are the skills that you get from that major. That is also why colleges make you take lots of courses beyond the major so that you learn across many disciplines, and acquire multiple skill sets as well as general knowledge about our world. It is all good. Learning is good. The answer to the question “What will you do with that major” is that you will be ready and able to do whatever comes along. Marcia Y. Cantarella, PhD, has held positions at Hunter College, Princeton University, New York University, and Metropolitan College of New York. During her 22 year career as a dean and vice president of student affairs she has enhanced the academic experiences of and outcomes for generations of students. 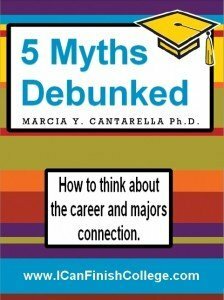 She is the author of I CAN Finish College: The Overcome Any Obstacle and Get Your Degree Guide where you can learn more about majors and careers in Chapter 4 “Which Courses”.